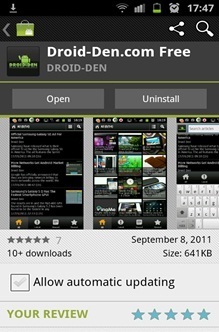 Droid-Den Android App Guest Review! We are holding a competition for our readers, for a chance to win the Donate version of our official android app, just submit a review of the application. If it gets published, we'll gladly hand over the ad-free version for free! Todays review is courtesy of readerÂ Naveen.K, anÂ Electronics and Communication Engineer, and android addict from India! 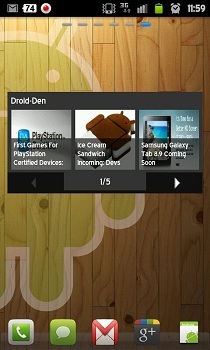 The Official App for Droid-Den.com is here with a bang with lots of Features!! 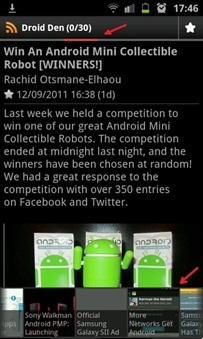 As a Droid-Den reader Iâ€™m reviewing the Official Android App in this Guest Post. Droid-Den comes in Two versions, a Free Ad-supported version and an Ad-free Donate version like most other Android apps in the Market. This Official App is helpful for the Droid-Den.com readers to keep up with the latest Android news, Updates and Articles using their Android Phones on the move. Open the App after Installing from the Android Market, Immediately you will find the blank page of the ready to refresh, Initial setup takes few seconds and needs an active Internet connection , the App starts downloading all the Articles from Droid-Den.com, So after downloading all the Articles the App refreshes and restarts. The App has four Tabs which acts like four pages, All Tab contains every published article from the site, Latest Tab has all the recently published , An Unread Tab and a Starred Tab. 'All' Tab shows the last 30 Articles. 'Latest' tab shows 10 recent articles. 'Unread' Tab has the recently updated Articles which are yet to be viewed. 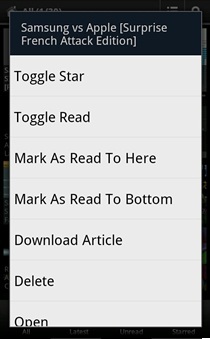 'Starred' Tab consists of all favorite Articles marked by the reader. All the above tabs previews in Grid and List view. While reading an Article itâ€™s easy to navigate between other articles using side scrolling over the article, also the preview at the bottom of the page can be used. Article transition Flow on the App is fluid without any stutters. Full screen Option helps to view the articles in a Full screen mode hiding the notification bar. Menu key gives various options like Search, delete and read for the Articles. 'More' button gets us to the Setting menu, The number of available options itself shows the Features available in the App. Looking forwards to some awesome Podcasts as there is already an option for it, The Podcast[Coming Soon]. Display and Presentation menu lets us choose between Light and Dark theme which is very helpful during night and day. The App has '16' Languages to choose from, Readers across the globe will love it. Volume Key Navigation is one of my favorite options as itâ€™s very easy to navigate to the next or previous article using the Volume buttons. Podcast Option has well-integrated media options, Need to wait to test it since itâ€™s not available yet. 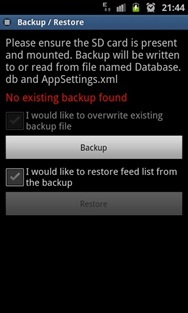 Article Update option lets us customize the update cycle as well as the manage article download mode. 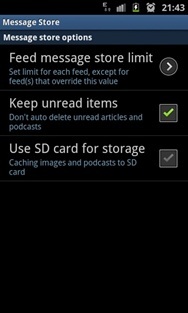 Message store Option has Backup option to store the downloaded Article feeds letting the readers to use the app even without a Data connection. The Overall experience with the App is Exciting, Surprised with the amount of features and the Smoothness of the app. 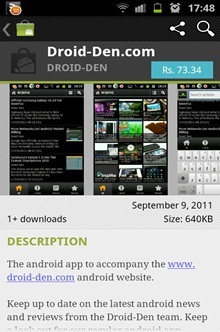 It is one of the Best Android apps for a Tech Blog available now. Adâ€™s are placed neatly at the bottom along with the article preview, so thereâ€™s no annoying Popup Ad. The Ad-free Donate version is available for just Â£0.99. Finally, the Droid-Den deserves a 5 star rating for this Wonderful App in the Android Market. Thanks Naveen! A free version of our Paid app is on its way to you!